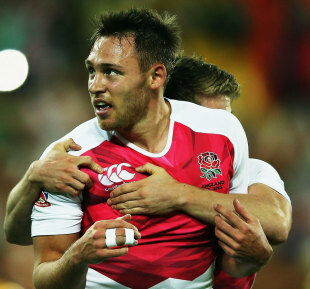 England returned to top form to claim the latest HSBC Sevens World Series title with a dramatic 24-19 victory over Kenya in Wellington. A sudden death extra time try from Sam Edgerley propelled England past their gutsy rivals in epic finale played out in front of a capacity crowd at the Westpac Stadium. Early Tries from Dan Norton and Christian Lewis-Pratt put England in control but back cam Kenya with scores from Horace Otieno, Oscar Ouma and Willy Ambaka putting them ahead at half-time. England rallied after the break but were repeatedly denied by a stubborn Kenya side determined to claim their first-ever Cup title. England were also forced to work hard in defence with Marcus Watson producing a superb try-saving tackle on Collins Injera to keep the game alive. However, the sin-binning of Ouma and Kenya captain Andrew Monde opened the door for an England comeback and Lewis-Pratt crossed for his second score in the dying moments of the game to send the contest to extra time where Edgerley struck with the decisive score. In the semi-finals Ben Ryan's side needed to fight back against Samoa to book their place in the final. Christian Lewis-Pratt scored twice and Marcus Watson once to lead England on a fight back from 12-0 down to an eventual 21-19 victory. Kenya booked their place in the final with a 19-14 extra-time win over the hosts, but New Zealand recovered from that loss to beat Samoa 17-7 in the third place play-off. The East Africans had served notice of their potential when they beat South Africa 21-20 in the quarter-finals when Willy Ambaka snatched a late try to win the match. New Zealand dominated Australia to win 24-5; England tore into Scotland for a 31-7 victory and Samoa were too strong for Argentina in a 31-7 win. Australia later recovered from their last-eight loss to beat Scotland 22-7 to win the Plate final. Shannon Walker scored two tries, while Lewis Holland added 13 points to end a disappointing week for the Aussies on a high. Canada brought a fruitful second day to a close with a 28-19 win over Fiji in the Bowl final, while Wales claimed the Shield with a 26-21 win over Tonga.